Did you know that up to 63% of furnace repairs can be prevented with proper annual maintenance and extend the average lifespan of your unit by 7 years?! Perhaps you missed your furnace tune up this year and consequently, it’s giving you troubles, but you’re not exactly sure what the problem is. If any of the signs below apply to you, your furnace may be in need of repair. Our highly trained repair technicians will do a thorough evaluation of your furnace and give you an exact “to the penny” price to repair your HVAC system before moving forward. To give you peace of mind during every season, repairs for your furnace and AC come with a Fixed Right or It’s Free Guarantee®! A more telling sign that you might need furnace repair is when you find yourself continually cranking the thermostat only to find that it’s just not cutting it. A few causes may be that you need a new thermostat or there’s a leak in your home’s ductwork. Leaking ductwork is a common boon to home heating. Each little crack and leak makes it so your system has to work harder to heat your home, pressure balance is off, and you are heating parts of your home, like your crawlspaces and attic, that you don’t want to heat. A Service Legends technician can perform a blower test to detect and fix all your duct’s cracks and leaks. In some cases, a professional duct cleaning can also significantly improve system performance. Stick your smartphone camera in one of your ducts and take some pictures to see what the condition of your ducts are. If you see large dust bunnies and foreign objects, like toys or food, consider having your ducts cleaned. Not only will it increase energy efficiency, it will also improve your indoor air quality. Another sign that you need your ducts cleaned is if people are constantly coughing, getting asthma attacks, or getting sick in your home. A potentially more dangerous indicator you need furnace repair could be due to incorrect gas mixture. If the pilot light on your gas furnace is burning yellow, this could indicate that you have carbon monoxide, a potentially lethal gas. In a properly maintained gas furnace, a pilot light should burn blue, indicating that the gas mixture is correct. Don’t forget to change your furnace filters once every 1-3 months. The air filter in your furnace is located in its blower compartment or possibly in a return air grill in your wall. If you have trouble locating your air filter, call your local Service Legends technician for help. 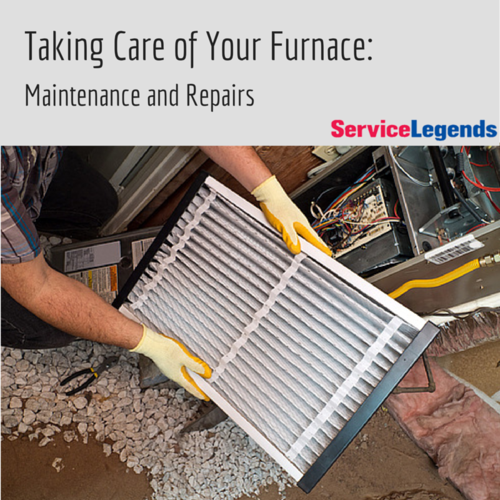 If any of these signs apply to your furnace, give Service Legends a call.